When creating our perfect audio scenario, attention will inevitable be drawn toward isolating the components from ground-borne vibration, thus insuring optimal musical enjoyment and less for the neighbours. Gerry has effectively Isolated his full Naim system including Ovator S-600s speakers by breaking the link between the floor and the equipment, freeing it from its inevitable resonance. These problems are normally associated with ground vibration travelling through older houses where wooden sprung floors need to be decoupled from the equipment. But what about newer builds? Concrete is seemingly rigid and can be a surprisingly perfect conduit for ground borne vibration, playing havoc and coursing super sensitive circuitry to jitter and the walls to shake. Gerry’s now fully floated Naim system Townshend Seismic Isolation has shown truly remarkable and cost effective results even on concrete! The pair of racks, weighting respectively 142Kg and 132Kg, have been isolated by removing the original feet and placing instead four load appropriate Seismic Isolation Bars front to back directly under the granite shelf. 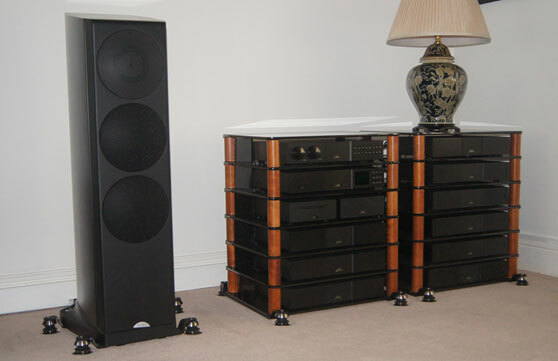 Link below to read Gerry experience on the Naim forum.